For the past week I’ve been working on a post for all you Advanced Web Ranking Cloud users. I brainstormed with some of my coworkers from Marketing and Support, and we came up with several ideas for posts that would help you use AWR Cloud better and make the most of its features. Turns out, there were plenty ideas to go around, so what started out as one post, might become a series of posts aimed at giving you some super-special-not-so-secret tips on how to “game” the system. It’s not actually gaming the system, so much as learning how to maximize the potential of your AWR plan and its resources. This first post is definitely aimed at both beginner and experienced users. Some of you may have already figured out the functionalities of the application, while for others they may be novel. So I hope you find the tips below useful in some way, at least partially. If you’re an AWR Cloud user, you know each of our plans comes with a fixed number of keyword units. Other than that, you can track as many websites as you like, across as many search engines as you like (we support 3000+), and create as many projects as you like. Keyword unit consumption is affected by the number of keywords in each project, by search engine units, by search depth, and update frequency. Generally speaking, if you find your resources to be insufficient, we would recommend upgrading to a higher plan. First, they help you keep your data tidy, notice changes easier, and draw the necessary conclusions to inform the next steps of your SEO strategy. Second, they help you notice whether you’re using resources unnecessarily, allowing you to redirect them to more useful projects. Whether you’re tracking rankings for one website or more, you probably use AWR Cloud by creating separate projects for certain pages (such as landing pages or pieces of content on your blog). You do this for high-converting keywords, for pages that are essential to your online business, or that are part of some campaign you’re running. 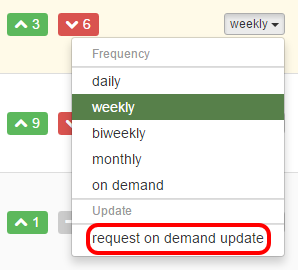 You can set up daily, weekly, biweekly, monthly, and on demand updates for your projects. This simple, but essential customization feature provides you with the opportunity to track rankings depending on their priority within your online strategy. While getting daily rankings for all your keywords sounds ideal, if you’re limited on resources, you have to admit that you can do with getting data more seldom on projects that are of no immediate or urgent importance. As you can see from the screenshot above, I choose a different update frequency for each of my projects within AWR Cloud. The two projects featured here are for two of my blog articles. The one above is recent, so I’m still tracking it daily to see whether it maintains steady growth. The one below is an older article that has great Visibility (it doesn’t rank on the 1st position, but it fluctuates between 2nd and 3rd, which I’m completely happy with). And I could probably already switch it to a biweekly or even monthly update frequency. So one of the things that you can do to manage your resources better is to establish or determine the priority of your projects and pages, and set updates in AWR accordingly: daily or weekly for those you need to constantly monitor, and weekly, biweekly, monthly, or on demand for projects that are already stable. If you’re an experienced SEO, you’ve probably figured this out – when you’re looking for long-term growth, you don’t actually need daily rankings. Of course, getting that daily data is essential in the beginnings of a project, so you can monitor rankings evolution up close and make the necessary tweaks and changes from the start. 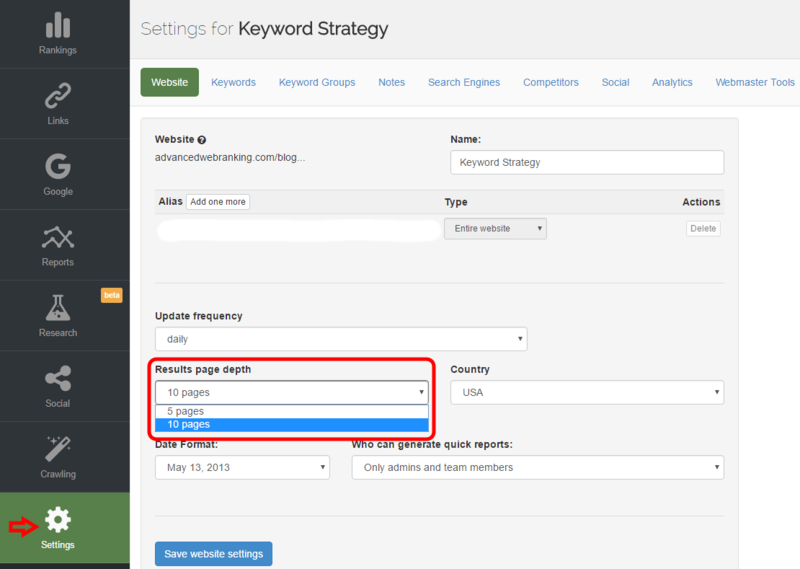 Or when you’ve revisited a page or article’s content and/or SEO and need to monitor how those changes affect rankings. But once you’ve done all that was possible, and your position is more or less stable, monitoring becomes a weekly, perhaps even monthly task. Since the advent of personalization (seen in full force this past year), you can’t know for sure how your rankings will fluctuate – all the more so in competitive niches. Now before you go crazy while consuming all your AWR resources, do yourself a favor and change the update frequency on those older projects! AWR Cloud can crawl the web for your chosen keywords with a search depth of 10 pages, or 5 pages. As you create new projects in the app, whether you’ve imported your historical data or are just starting fresh, it’s recommended you set them for a search depth of 10 pages. This would allow you to get a better overview of how you rank for all your targeted keywords. Once AWR has found data for all your keywords, you should be able to determine (in case you didn’t already know) your best opportunity keywords. However, a 10-page search depth also means doubling up keyword unit consumption for the project. In order to reduce keyword unit consumption, you can limit search depth to 5 pages. Then, a good approach would be to create two separate projects for the same page/URL or domain. Divide your keyword list into two separate groups – those you want to rank for above the 5th page, and that receive most of your effort, and those you are less keen on ranking high for, but are still of interest to you. These could be keywords with high competition, broad terms, Search Console terms that you rank for involuntarily, or terms that you plan on targeting more actively later on but would still like to gather some data for. Next you can set up different search depths for each project and consume exactly as many resources as needed. Another tweak is to set your 10-page depth project on a lower frequency update – biweekly, monthly, or on demand. use the 10-page search depth for new websites and/or new landing pages that have no rankings yet, for domain changes, such as name change or migration from http to https, and to track the recovery process after a Google penalty. To keep a good track of keyword unit consumption, you can always check the “YOUR [plan type] RESOURCES]” at the bottom of the menu. There, you’ll see how many resources you’re currently using, how many are available, how much each project consumes, and how we calculate resource consumption. As a default, for each new project you create, AWR is set up for (the) three major search engines – Google, Yahoo, and Bing, which it crawls with geolocated proxies to ensure the accuracy of your rankings. This group is treated as 1 search engine unit, but any other one search engine you add after that counts as 1 search engine unit as well, doubling your keyword unit consumption for each project. However, it might help you to know that you can customize your first search engine unit. 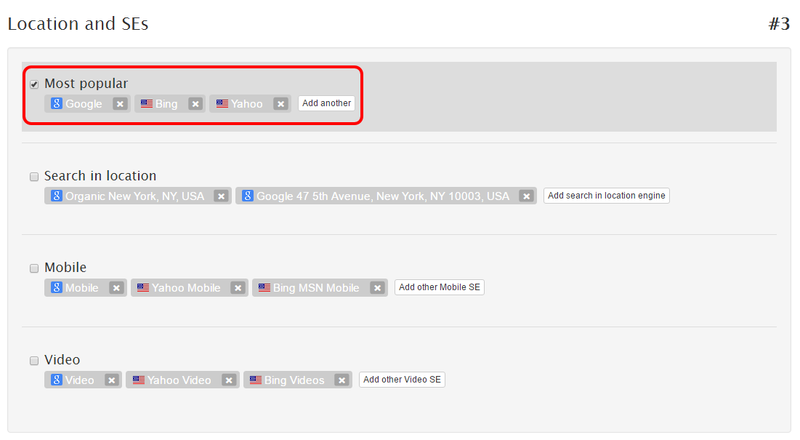 So, for instance, if you want to measure how you rank on Google, Bing and AOL, that counts as one unit. Our tool treats these first three as one unit as long as they’re different domains. For Google, Bing, and, say, Google Images, the first two are counted as one unit, and the latter takes up another unit. As you can see from the screenshot above, when you create a new project, the third step is selecting the search engines you want to track rankings for. All of the categories (Most popular, Search in location, Mobile, Video) are customizable. In the first category, you can either add more SEs to the default ones, or remove them and add your prefered ones – if they’re three different domains, they’ll be counted as one search engine unit. Of course, you can find all this information within the app, as well as on our documentation pages, but I wanted to mention it here all the same, for new users of AWR Cloud. Another tip you might find useful about search engines and resources management, and which is kind of obvious, is to consider tracking only the search engines you definitely need to rank in. You (and/or your client) need to know your market, your industry, and where your ideal customers are. That way you’ll be able to focus your SEO strategy and only dedicate your efforts – and resources – where they are truly needed. AWR Cloud can track rankings across 3000+ search engines from around the world, which makes it a great option for SEOs of all types. But this variety isn’t meant as a way for you to waste your plan’s resources. On the contrary, it’s meant to help you direct your resources appropriately and to track rankings for precisely the search engines you’re interested in, whether they be global, local, custom location, image, mobile, sponsored location search engines, and so on. You’re a professional SEO, so you know this better than anyone – you can’t always rank, and rank well, for the terms you need/ want to target. Sometimes the terms are too competitive, and the competition is harsh. Other times, it may require too many resources on your part to improve your site’s position for a certain keyword – such as creating highly valuable and compelling (long form) content, better than your competitors’, earning links through that, increasing traffic, and so on. Yet with all your efforts, you still might not be able to outstep the competition if their site authority is bigger, if they’re on an older domain that has built a loyal, recurring audience, if their online brand is stronger, etc. And you also know where I’m getting with this. If you can’t rank for it, why track it? Simply put those highly competitive terms aside in a separate list (outside of AWR Cloud) and keep them for future targeting, when your website will be stronger, have greater visibility, and steadier traffic. You can also apply what I’ve been telling you about on section 2 of this post. Create a separate project for the very competitive terms and set it on a low update threshold (monthly) – this helps you consume 28x fewer resources than you do with daily updates. The number of resources you need may, and probably will, fluctuate. Whether you’re doing in-house SEO, freelancing, outsourcing, or working on your own site/s, the longer you keep a site alive, the more it will expand, and so will your content strategy – or perhaps product pages in the case of eCommerce. This means you’ll need to track more and more terms. Or you can take into account the tips this article has been sharing, and stop monitoring older terms too often. A regular check-up on them every few months should do. You can use our resources calculator to find out what plan is best suited for you according to the number of search terms you need to track. That way, you only pay for what you use. And if you’re already using AWR Cloud but your resources have become insufficient, or, on the contrary, keep finding that you’re not using all your resources, the calculator will help you decide whether you need to upgrade or downgrade your plan. Just contact our customer support and they’ll be happy to help you set up a custom plan that perfectly matches your needs. If you’ve got older projects with historical data that’s important to you, but which are no longer a priority, you can pause them in AWR Cloud by setting them on “on demand”. The tool will no longer extract rankings for these projects (this update needs to be fired up manually by you every time you want fresh rankings data), and your keyword unit consumption is reduced. Similarly, you can set them up on an “on demand” basis temporarily, in case you’ve got other priorities at the moment and need to direct your keyword unit resources to other projects. The more drastic measure is to delete projects that are no longer useful. And if you still want to keep a record of your past work, you can simply export the data you’ve gathered and file it away with other past projects. So you’ve seen a few ways that you can manage your resources better in AWR Cloud while maximizing the tool’s potential and analyzing the data it gathers for you. I hope at least some of them will have proved to be a useful insight, and that they’ll help you take easier strides towards your goals. Now I’m curious to hear whether you’ve got similar tips and tricks on maximizing the potential of your resources. Share your AWR Cloud knowledge in the comments with other users!